The photograph above is an example of the tools I sell for the safe disassembly and assembly of all Kalashnikova variants of AK47, RPK, AK74, Krinkov, PSL, and SVD rifles. These tools are the pressing plates, sets of pressing tubes, barrel push-back and push-out tools, and pin pushers and press ram adapters. 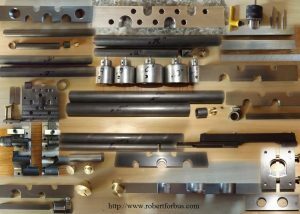 Just refer to the tab above named “AK Barrel Assembly Tools” and select what you need from the drop-down menu and then send your request to me via Email at Robert.Forbus@robertforbus.com and I will return with availability and pricing. I know that I should not need to mention this, but I will do so anyway. All of the tools that I sell require a significant amount of force to fulfill their task and there is always a hazard of a tool shattering or suddenly flying from a press. At a minimum please wear shatter-resistant eyewear, a.k.a. safety glasses, goggles, or faceshield when using any of these tools. How Do You Order Tools From Me? I am not set up for credit cards at this time – maybe someday. I do accept personal cheques, money orders, and PayPal as long as it is paid as “Goods & Services”. Generally speaking; unless the item is a custom tool or machine part I do not require any payment up front. I usually have everything that I sell in stock but many of the items I sell are produced in run groups from four (04) to forty (40) parts and I occasionally may be out of an item or a component of an assembly and have them in the work schedule. I can give you a fairly accurate ready date barring emergency or contract work that takes me temporarily off premises. When you to write me as a new customer; please give me your first and last name because I build/edit a job folder for everyone. I have isolated certain tools by the rifles they are designed for. If you are not 100% sure of what you need; you can send me an email with your questions or for a much quicker response you can call me at 615 390 5645 any day any time. In a typical day I receive about one-hundred (100) email messages and it takes time to get though them. Tool Description Stock? Qty.? When? Many of the Zastava M72 and M70 rifles are missing dowel pins for the individual blocks. I offer a set that fits the M64, M70, M72, and M76. These are sold only as complete sets – not individual pins. 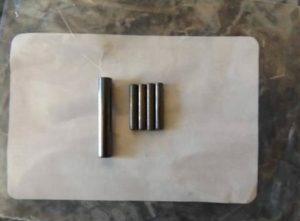 These are cut from hardened gauge pins, chamfered, and tempered The price shipped is $19.67 cheque/money order or $20.56 PayPal “goods and services”. I plan to keep these in stock. Many Romanian rifles with the sidefolding stock are missing screws. 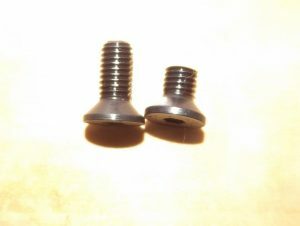 These screws are of special head diameter and shank length and not available as general hardware items. The original screws are similar to a Fillister head type that is obsolete, although they do occasionally appear. The type I sell are modified socket flat head screws that have the head machined and the short length required of the outermost screw, and are blued. The price shipped is $5.00 cheque/money order or $5.45 PayPal “goods and services”. I plan to keep these in stock. There are some excellent and inexpensive technical references for the headspacing and other critical building/repair methods for these rifles. The original manuals of the DDR have been translated and reworked by Mr. John Baum and a couple I recommend can be found at https://www.germanmanuals.com/manuals.html . I recommend “AK47 Repair Manual – East German Issue” and “MPi (AK-47) and Makarov Pistol Tool Kit Manual – East German Issue”. These are not “how to build” manuals but they present all of the critical points of assembly not covered by other peoples’ publications and the specific tools used – many of that I sell. Robert Forbus is a toolmaker and a senior mechanical engineer with a career spanning four (04) decades of ground-up design, manufacture, and assembly of machinery as well as plant process systems. I have intimate familiarity with printing presses, finishing equipment, web-handling equipment, stamping/forming dies, and a wide array of other machine tools. While this website is dedicated to the various builder and armorer tools sold by me, my engineering expertise and project management experience is “for hire”.